"But I'm Still Fly" by Fahamu Pecou, acrylic and gold leaf on canvas, 2014. Click image to view larger. It's been a year of achievement for Emory doctoral candidate Fahamu Pecou, a fast-rising young artist-scholar whose thought-provoking work has won international acclaim for challenging concepts of black masculinity. 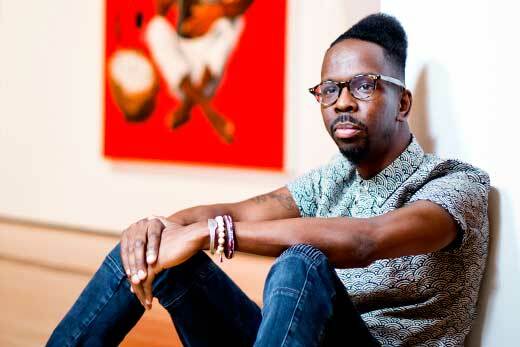 Just as his exhibit and collaborative project "Imagining New Worlds: Wilfredo Lam, Jose Parla and Fahamu Pecou" is entering its final month at Atlanta's High Museum of Art — and his next exhibit is due to open at the Backslash Gallery in Paris this summer — Pecou has received word of yet another honor. 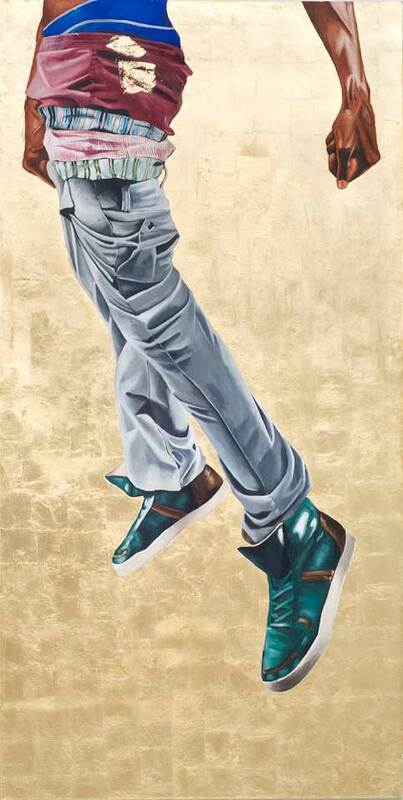 "But I'm Still Fly," a painting from his recent GRAV*I*TY exhibit, has been acquired by the Smithsonian National Museum of African American History and Culture (NMAAHC). The 120" x 60" painting, using acrylic and gold leaf on canvas, is part of a series of studies invoking the low-riding fashion trend of "saggin'" as an allegory to comment on contradictions of mobility, access and agency for young black men, according to his artist's statement. Currently under construction, the museum is scheduled to open in 2016 on the National Mall in Washington, D.C., on a five-acre tract adjacent to the Washington Monument. It will be the largest institution in the nation dedicated completely to the African American experience and its impact on American history. Through its visual arts acquisitions, the museum seeks to assemble a "comprehensive collection of fine art to include painting, sculpture, works on paper, art installations, photography and digital media by and about African Americans — we intend to present American art history through the lens of the African American artist," according to an NMAAHC statement. The acquisition of Pecou’s work occurred after Atlanta art collector Greg Head and artist-collector Kevin Cole invited NMAAHC curator Tuliza Fleming to Atlanta to view the GRAV*I*TY exhibition, held at the Museum of Contemporary Art of Georgia. After the exhibit closed in February, arrangements were made for the painting to travel to Washington so that it might be considered for the NMAAHC collection. “I thought that his work addressed some really important issues dealing with the lives of young African American men in this country,” says Fleming, who is the lead curator for the visual arts gallery. To know that his work has now been purchased for that collection "feels pretty amazing," says Pecou, who is in his third year of studies in Emory's Graduate Institute for the Liberal Arts (ILA) and Laney Graduate School. "Obviously, you imagine having these kinds of accomplishments in your career, but there is no outline, no instructions for how to do it — and everybody's journey is different," Pecou says. "In the coming weeks and months I'm going to have a day when I sit down and actually feel the weight of all the things that have been happening over the last few months — it's almost surreal," he adds. Pecou credits his studies at Emory for informing the intellectual and creative vision behind the GRAV*I*TY exhibit. "One of the things I was doing was responding to some of my academic work, how we are reading black masculinity, how that relates to how black men are performing, and how cyclical it all can be," he explains. "When we weigh young black men down with these negative and restrictive notions of their opportunities and abilities, we are creating a space where they don't want to try — GRAV*I*TY was done as a way to kind of combat that," Pecou says. "We're not just thinking about black masculinity as this treacherous identity. If we changed the way we thought and talked about it, it could change the way young black men perceive their own identity." Pecou's latest exhibition at the High Museum of Art, which responds to the work of internationally renowned Cuban-born artist Wilfredo Lam, will be on display through May 24.